British Politics Someya Qureshi A constitution is a system of laws, customs and conventions which regulate the relations between the area's of the state and the citizen. A constitution sets out the system of government 'The whole system of government of a country, the collection of rules which establish and regulate or govern the government'. It is primarily a set of rules specifying how a country should be governed. It often refers to a document or documents which embody the most important laws establishing the structure and principle of government. 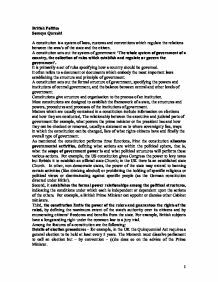 A constitution sets out the formal structure of government, specifying the powers and institutions of central government, and the balance between central and other levels of government. Constitutions give structure and organisation to the process of an institution. Most constitutions are designed to establish the framework of a state, the structures and powers, procedures and processes of the institutions of government. Matters which are usually contained in a constitution include information on elections and how they are conducted, The relationship between the executive and judicial parts of government for example, what powers the prime minister or the president has and how they can be checked or removed, usually a statement as to where sovereignty lies, ways in which the constitution can be changed, lists of what rights citizens have and finally the overall type of government. As mentioned the constitution performs three functions, First the constitution allocates governmental activities, defining what actions are within the political sphere, that is, what the scope of government power is and what political structures will perform these various actions. For example, the US constitution gives Congress the power to levy taxes but forbids it to establish an official state Church; in the UK there is an established state Church. In other, non-democratic states, the power of the state may extend to banning certain activities (like drinking alcohol) ...read more. The Queen by convention invites the leader of the majority party to form a government; strictly speaking this means anybody who can support a majority in the Commons. Another function is The representative function, where MPs represent their constituents or groups on specific or general matters to MPs. MPs receive a constant stream of mail, and enough letters on one topic will ensure it is raised in parliament; the anti-abortion groups are especially good at getting their supporters to write to their MP every time abortion policy is reviewed. The Financial role. Parliament authorises tax measures and the level of public expenditure; this principle was established in the 17th century, and today the most powerful select committee is the public accounts committee, which is responsible for checking that government departments spend public money in accordance with the wishes of parliament, and achieve value for money. The PAC is chaired by a member of the opposition. Parliament also Contributes to the political debate and agenda: This is what one commentator called the 'Grand debate': Most important public events will be raised in parliament through ministerial statements or questions. The Judicial function. Parliament is the highest court and this function is generally performed by the Judicial committee of the Lords The House of Lords acts as the highest court in the land, and this function is performed by the 12 Law Lords, who include the Lord Chancellor, ex Lord Chancellors, and Lords of Appeal Ordinary. The Lords of Appeal hear cases from the Appeal Court and so their decisions set a precedent for the lower courts; this is a way in which judges make law; this is called the Common law or case law. The general process by which the courts interpret the law is called judicial review. Parliamentary government differs from presidential government in the ways listed below PARLIAMENTARY GOVERNMENT PRESIDENTIAL GOVERNMENT The Assembly Becomes a Parliament: Usually the culmination of a process from monarchy to assembly challenging monarchy's hegemony to assembly taking over responsibility for government. ...read more. Critics point out that the principle is implicitly authority leading to `elective dictatorship` when the parliament is executive dominated. Parliament is Sovereign as it exercises absolute and restricted power in that it stands above all other associations and groups in society. Parliament is sovereign, as the state is a sovereign body processing supreme authority over its members. This authority includes extreme powers of coercion. Alone, among associations, the state may imprison us and, in the ultimate analysis , it may have the right to take our lives. Parliamentary authority in the united kingdom is unlimited. Parliament can make or unmake any law on any subject whatsoever, and it can do so retrospectively. But although Parliament is sovereign we should bear in mind that Parliament has lost its Sovereignty in a number of ways. Firstly by delegated legislation, where powers have been handed down to other inferior UK bodies that means Parliament has lost some control. Parliament and UK courts are bound by the European Union implementation of the Human rights act 98 which is another factor which foresees parliament for losing its sovereignty. Judges having the power to make law means that they have taken some of parliaments powers. The mischief rule may also alter the intention of parliament. Bu when looking at the factors I am going to mention we see that parliament is still sovereign as its inferior bodies still have limited jurisdiction, meaning that any law that is made does not effect the whole country. An enabling or parent act can be replaced. Parliament also allows judges to consult to certain aids. But as most judges are literal rule judges they tend to adopt governments ideas. So although we see that Parliament is sovereign in that it can make any law it wishes that can overrule any other law it loses its sovereignty when it comes to issues regarding delegated or sub delegated legislation where power and authority has been given to other members other then those of parliament. 1 ...read more. To what extent has Parliament lost Sovereignty? the one's who change their own laws which shows they still have Parliamentary Sovereignty. Devolution is when a supreme power gives its powers to local areas. This has affected Parliamentary Sovereignty. In this case Parliament passed a law for the Scottish Parliament and Welsh Assembly to take power of themselves. To what extent is Parliament supreme? The Act makes the European Convention on Human Rights part of English law. It does not give it a status that is any higher than an ordinary Act of Parliament. Describe the formal process of statute creation in parliament. If an agreement is not reached a conference may be held to reach a compromise, the Bill is defeated and dies or the Parliament Acts are resorted to by the Commons. The very last stage is the Royal assent; this is where the monarch gives formal approval of the Bill so that it becomes an Act of Parliament. Devolution has meant that politics has become closer to the people in Scotland but Iain Macwhirter claims that Scotland has been swept "by a tidal wave of disillusion at the succession of disasters that have marred devolution's infancy." He also claims that there has been a "meltdown" in the Scottish public's confidence in the devolutionary process. To what extent does ministerial responsibility ensure accountability to the government? The confidentiality of Cabinet discussions is protected by prohibition against disclosure by members of the Cabinet. Additionally, there is a rule that a current government cannot publish previous government's papers without their consent, or to a government with different political persuasions, unless a document which is an exception to the above. How effective are M.P. 's at scrutinising the Government? In addition Select Committees seem to be at the mercy of government. These committees do not have subpoena powers. Therefore although they have the power to call witness's and evidence, the government have the power to refuse to give them the written evidence, and the witness's don't have to answer any of the questions asked.